Vaccination records for Bordetella, Distemper, Parvo, Canine Influenza and Rabies should be faxed over before arrival. Adequate telephone numbers should be provided in case we need to contact you. A scheduled pick up time should also be discussed upon drop off. Although cancellations for daycare reservations do not incur a fee, as a courtesy we request 24 hour notice. For reservations at Morris Animal Inn you should contact us directly. All reservations must be confirmed by telephone or in person. Our pet care consultants will be happy to discuss all of the options Morris Animal Inn has to offer! Can I add more activities to my pet’s daycare? Absolutely! 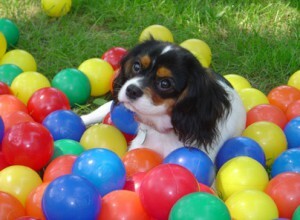 We have a large selection of playtime services and activities to make your pet’s stay comfortable and fun! Can I add a grooming to my pet’s daycare reservation? Of course! Morris Animal Inn offers a Spa Day in which guests are individually handled during the day, half of which is spent in our Daycare program and half in our grooming salon. They receive one playtime session with their own Activities Counselor and a wholesome snack break. Our receptionists will be happy to book your Spa Day reservation and go over the type of grooming you would like for your pet!